Protection against demons, foes, and jealous ones! We present to you this incredible opportunity up for your most serious consideration! Many years ago we were able to contact and bind ONE Han Dynasty Jinn and hoped we would be so fortunate as to be able to contact more from the Han Dynasty. We are incredibly happy to Sri, our friend and conjurer, who was able to accomplish our goal of getting more of these incredible spirits to offer to our friends and clients! We have received around 4 of these spirits that Sri was so kind to bind openly for us. Each one will have a slightly different statue, so the one you see pictured IS the one you will be receiving, and we will change the photo as each of them is rehomed to a new spirit master. All of the statues came directly from Sri's personal collection in Norway, and they are old and aged in a variety of ways. They are NOT free of perfections, nor does this jinn inhabiting them want them to be, so we recommend moderate cleaning, but not disrupting their natural aged look. The jinn bound relate deeply to their vessels, which is why when Sri found them years ago, he kept them in case he was ever able to make contact again with another Han Dynasty spirit. 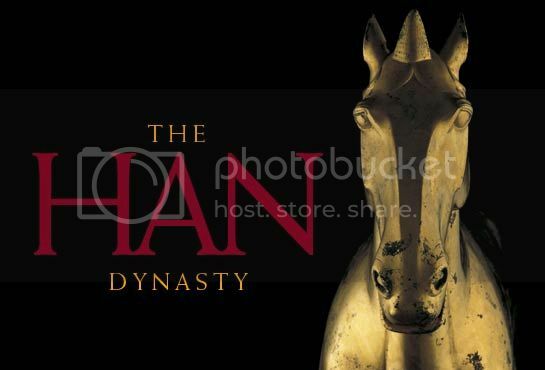 The Han Dynasty, existed MANY years ago, in what exists today as parts of China and Vietnam. At that time, there had been a great Civil war fought on China's soil, and the Han Dynasty took over control of the region/empire. 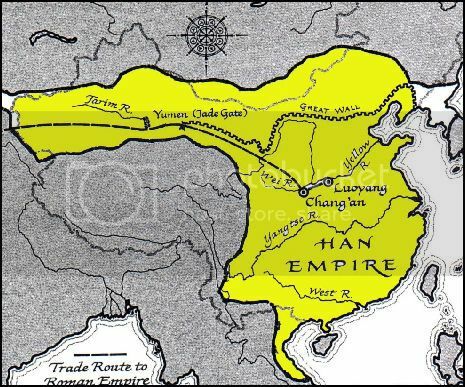 The Han empire began in 206 B.C. when rebel leader named Liu Bang defeated the Qin army, and as a result, he overtook the throne as Emperor Gaozu. The end of the Qin was part of a larger rebellion that began after the First Emperor's death. The tyranny of Qin's leaders and their Legalist standings were no longer being tolerated by its people. According to traditional Chinese history, the Han amended its form of governing to include a doctrine of Confucian principles, which stressed unity of father/son/family, and the worship of its ancestors. In effect, the Han was noted for its expanding of national territory and for promoting its literature and arts. The Han, under one of its many rulers, Wu Ti (140 87 B.C.) succeeded to unify China by expanding its military prowess across the borders of other regions of Asia, diminishing the powers of imperial nobility. Eventually, Wu Ti moved the capital from Xi'an to Luoyang in the east, forging an era called the Eastern Han. However, there are records to indicate that there were two Han Dynasties, each being repudiated by the other Han descendents. 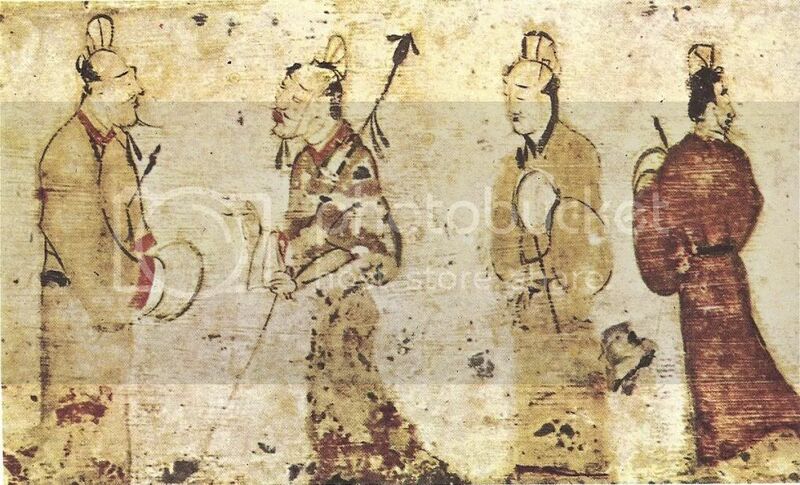 The Early Han (Western) dates 207 - 25 AD, and history books suggest that at the demise of the ruler Yuan Ti (in 32 B.C.? ), his widow used her influence to appoint family members, and eventually a nephew, Wang Mang was made emperor, forming the Xin (New Dynasty?). However, that was short-lived (22 AD), when Mang was killed in an uprising, to be succeeded by Kuang-wu Ti in 23 AD, forging the the second Han era called Later Han Restoration (Eastern) from AD 23 -220. 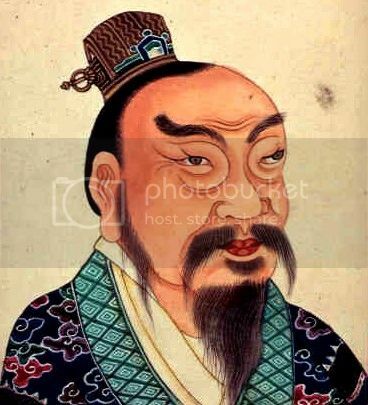 Confucius theory became part of the Legalist form of governing. For example, administrators and other students were educated through a newly established Imperial Academy, where students were to study a variety of Confucian classics, and other courses to end in an examination. If the student passed the exam, he was appointed to a governing post. If the student had failed the exam, he was likely beheaded. This course of exams became known as the start of the civil service examination system. Wealthy families began to advance in education, and to a degree, became historians in their own right...with the creation of an encyclopedia and other works. With the support of Wu Ti, A well-known historian, Sima Qian, created the first great work, called the Historical Records, that would become a standard model for the next 2,000 years. During the Han, a trade route called the Silk Road was built to expand trade between China and the Roman Empire. The Silk Road actually consisted of more than one possible route through the mountains that the traders followed. Agriculture grew with the development of better tools. Harvesting silkworms and weaving silk for trade was important to the Han's economy. Additionally iron and salt were big commodities during this era. This helped create a mass of wealth among traders, eventually forming a surplus system, however, it failed shortly after its was instituted. The second Han Dynasty had much success with their foreign policy. Part of this success was due more to luck than to anything the Han did. The Hsiung nu who had previously been one of the most dangerous enemies of the Chinese were defeated by the Hsien-pi and the Wu-huan. Half of the Hsiung nu moved south, and became part of the Chinese empire. The Hsiung nu appeared to be trying to reunite and form a large empire comprising all of Turkestan. Thus, in 73 A.D. the Chinese began a campaign in Turkestan. The whole of Turkestan was quickly conquered which would have ensured a trading monopoly, however, the emperor Ming Ti died and Chang Ti became emperor. He favored an isolationist policy so that much of what was gained in Turkestan was now lost. Pan Ch'ao, the deputy commander who had led the invasion, stayed in Turkestan to try and hold onto what had been won, and eventually in 89 A.D. a new emperor came to power with a renewed interest in holding Turkestan. Despite this military success, economic and political struggles arose within China. Internal struggles for power taxed the peasants, until in 184 A.D. when another peasant uprising occurred. This movement was begun by the Yellow Turbans. This uprising served to unite the factions who had previously been fighting one another because they needed to unite to defeat the Yellow Turbans. Despite conquering them, China did not return to a united state. Rather, three kingdoms emerged and the Han dynasty came to an end. The purpose of explaining the Han Dynasty to you was because we want you to be familiar with the life this jinn led so many years ago, his relative age, and experience. Of course, he comes with many gifts and talents, some possessed by many jinn, and some gifts that he alone has mastered during his days. First, he is an excellent protection spirit. Honestly you probably could not have a more loyal companion or ally on your side. He wants his next master to understand the consequences of his or her actions. That is quite important to him. He told us of many battles, in a time when he was serving the emperor Han Chengdi, and the many riches he had afforded to gift him with, all of which he greedily spent, much to the demise of the people at the time. Up for your consideration, is a male jinni of the Marid Royal Phylum. He, like the last jinn of this dynasty we rehomed, is also hoping that he gets a good master, with clean positive intentions. He will not work magick to hurt another person or spirit. The jinn of this time period lived in an area of much loss, greed, suffering of people. It was an endless life of fight. They no longer wish to serve those who are putting others through such horrid ordeals. They would like someone hard working, and kind. Looking for a master who is okay with spiritual development, as the spirit would like to psychically train his master to see the paranormal and communicate better. Jinn of the Han Dynasty have great skills in mastering telepathy and psychic enhancement, generating luck and financial success for his master, strength and endurance training both mentally and physically, giving his spirit increased energy physically and psychically, and protecting his spirit from attacks on the psyche and to his personal body from others and from demons or curses sent with ill intentions. These jinn will have your back ten fold. The possibilities are endless when you adopt a jinn of the Han Dynasty. An evocation ceremony will be necessary to contact the spirit by name, summon and start bonding with him. Instructions will be sent to his new master by email. As always, please check out our many testimonials located on our website! Rebecca, I was not such a believer at first because I was worried that the magick wouldn’t work for me. I was so wrong. I am forever grateful, and my family is as well! I think you magick is sooooo powerful that someone is going to make it illegal. Good thing I found out about it before the Illuminati makes it illegal. Thanks for being you! Thanks for finally being real. I have bought tons of other “fake” crap on the internet and never had results. I buy something from you, a spell cast ring, and it’s like suddenly I have a new respect for the craft. You are the real deal. For all others out there, buy from this girl, she is full of knowledge, but her items really work. I bought a spell ring for rekindling love, and literally a week later I made a date with my high school sweetheart. It’s the magick, and it gave me the guts to go for it.